Fewer than one in five computer science college graduates are women. About 24 percent of tech jobs are held by women. But a national program is on a mission to change that, and the efforts have reached Crook County through a national curriculum called Girls Who Code. "The whole purpose of this program is to try to train girls in computer science and get them interested in computer science so that we can close that gender gap in computer jobs," explained Crook County Library Teen Services Librarian Heather Jones. The library has partnered with The Landing, an after-school teen program, to offer Girls Who Code to middle and high school students. 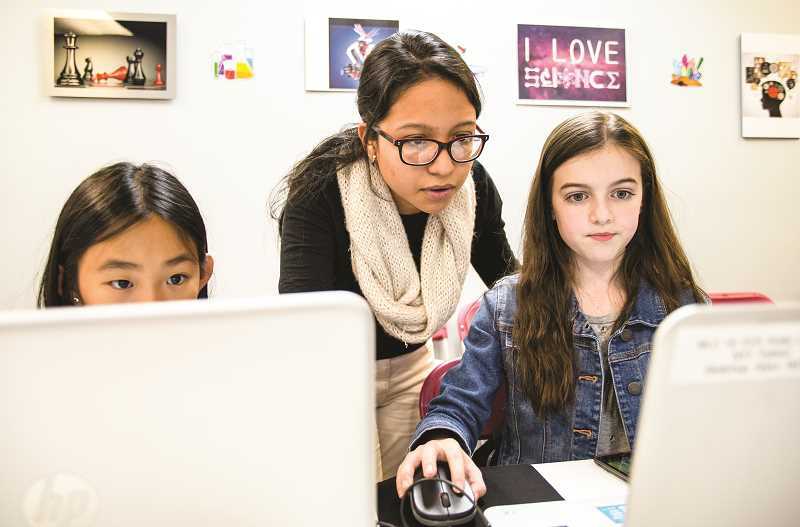 The Girls Who Code mini club will meet from 4:30 to 6 p.m. each Thursday for 10 weeks beginning April 4 at The Landing, which is located on the second floor of First Baptist Church in Prineville. "This program focuses on choosing a problem or something in your community that should be fixed through coding," Jones said. "If they want to learn animation, then they'll learn one type of coding, or if they want to learn an app, then they'll learn a different kind of coding. It really can be tailored to their own interests." This is not the first time Girls Who Code has been offered in Crook County. The previous teen librarian conducted the series last year, and when Jones came on board in December, she, too, wanted to offer it at the library. Although she had a handful of students interested in the program, many were unable to get transportation to the library for the weekly lesson. She happened to meet with Brittany Hall, the director of donor development for Central Oregon Youth Development Inc., which oversees The Landing, on International Women's Day earlier this month. They started talking about the transportation issue and formulated a plan. Local middle and high school students congregate at The Landing from 3 to 6 p.m. Monday through Thursday on school days. It's a safe environment where students can receive homework help, a free meal and can take part in healthy activities. Hall said more than 150 teens are registered for the program, and they typically serve around 35 students each day. Eight of her students had wanted to take Girls Who Code. "One of the barriers that teens have here in Crook County is transportation and getting to the library," Jones said. "We decided it made sense for me to go to where the teens are instead of them coming to me." She pointed out that the library and The Landing have shared goals of supporting teens in the community and creating educational opportunities. "It just made sense to partner on this. It was a natural fit," Jones said. "It gives me an opportunity to get out into the community – extend the library services outside of just the library and make it more accessible for some teens that can't necessarily get here." Students who belong to The Landing may join Girls Who Code, but it is also open to all teens who are interested in computer science. Participants do not have to register with The Landing in order to participate. Although the program is designed for girls, Jones said boys are also welcome, as long they are "cool with working in a female-centered environment." Jones will facilitate the series. A national, nonprofit program, Girls Who Code was founded by a woman in 2012 with the mission to close the gender gap in technology. Funding comes from a long list of donors, allowing organizations to obtain the web-based curriculum without charge. Students will use laptops from The Landing and the library. Or, if students have a school-issued Chromebook, they may use that. Each of the 10 meetings begins with a Spotlight. "They have a short story about a woman in a tech job and the cool things they are doing with coding," Jones explained. One tells of a woman who uses coding to illuminate LED lights that go along with her dance moves. Next comes the planning stage, where students will come up with a coding project. Then, there's the daily computer science lesson. The meetings conclude with Standups, in which students share their progress. Hall said the Girls Who Code project might be an oral history project in which teens interview local senior citizens and use their coding skills to record the stories and use different media platforms to document their findings. "We're so excited to be partnering like this," Hall said. "We have a big group of females. This would really motivate them to really start thinking about their future." Jones agrees, adding that the program not only focuses on coding, but other skills such as teamwork, bravery, resilience and problem solving. "Even if coding is not something the girls continue with, it's those problem-solving skills they can use in pretty much every aspect of their life," Jones said. The 10-week series runs 4:30-6 p.m. each Thursday beginning April 4 at The Landing, located upstairs at First Baptist Church, 450 SE Fairview St. in Prineville.